You don’t get to choose which family you’re born into — that part of your story is written way before you learn how to take a crayon, hold it between your fingers, and let your imagination run wild. But, you do get to choose how to love your family. Whether that love is reciprocated depends on a variety of circumstances and situations, but what if those too are out of your control? Olivia Haller provides theatre-goers with a lot to return home with and unpack in future conversation. 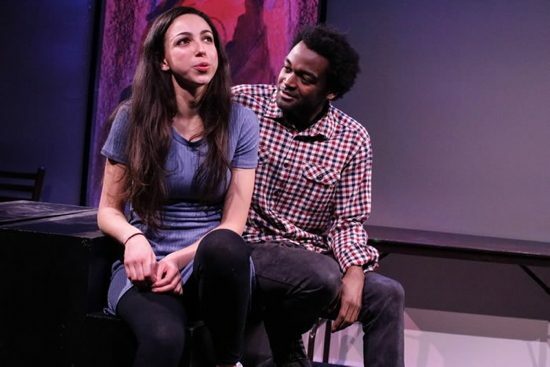 Written by D.C.-based playwright Olivia Haller, and produced during the second Women’s Voices Theater Festival, “This Is All Just Temporary” follows Lauren (Fabiolla da Silva), a recent college graduate, as she returns home to the family life she left behind. Her family life revolves around a younger, autistic brother, Noah, who seems to be triggered more often and more deeply as of late. Having spent time away from Noah, Lauren struggles to accept a reality that she finds unfamiliar after temporary independence. Her college-bred, “save the world” mentality cannot master the chaos. The play starts with everyone on stage, taking deep breaths, chests rising and falling in a dimmed light. Suddenly, static sounds are heard and everyone scurries to their places. Lauren’s mom, Lou (Taunya Ferguson), explains her son’s behavior to Amy (Raven Lorraine Wilkes), a therapist brought in to help the family defend themselves against Noah’s biting tactics. The scene not only highlights the uncertainty and guilt felt about taking physical action against Noah but also whispers messages about today’s shaky, patriarchal society. Lauren’s father Cal (David Walsh) claims he understands the actions he and his family need to take next time Noah tries to bite one of them, but refuses to show Amy he can physically do them, instead pointing to his daughter and son’s nanny, Sherry (Annette Mooney Wasno), to prove their strength. Lauren does find some relief through the chaos when she meets Gabriel (Axandre Oge) while working at a gelato shop in Alexandria, VA. The two bond quickly, yet awkwardly over the commonality of having younger autistic siblings. Gabriel hasn’t ever really left his family, nor seems to feel as compelled to as Lauren does (again), but that doesn’t affect their connection until later in the story. Fabiolla de Silva’s portrayal of simultaneous anger, guilt and love for her brother is superb and quite relatable for those living through a similar family dynamic. Another notable performance could be seen in Taunya Ferguson, who also showcased a variety of intense emotions, ranging from the grief associated with empty nest syndrome to the eternal self-doubt regarding how she raised her children. Madeline Belknap’s costume choices were appropriately chosen; however, the decision to dress Lauren on stage was a bit distracting since the other characters made most of their changes behind the scenes. While the Convergence Theater is tiny, Carrie Kirby and Laura Schlachtmeyer made great use of the space. The stairs helped distinguish Lauren and Gabriel’s walk in the park from the steps in the family’s home. Key to understanding the plot and set was Noah’ bedroom door, which had a drawing taped to it. A quick turn of the door helped the audience distinguish between Noah’s presence and another entrance. While Noah never physically appeared on stage, making it hard to feel as deeply for him as one did for Lauren or Lou, his presence was clearly marked. Philipa da Costa’s ability to quickly shift fluid sounds to static noise, and change projections from blue shapes to harsher reds shadows, helped the audience make a connection to Noah’s presumed emotions. In sum, “This Is All Just Temporary” is a superb story of how a family’s undeniable love surpasses the exhaustion felt fighting society’s, and consequently, one’s individual fear of a stereotyped, misunderstood disability. Olivia Haller provides theatre-goers with a lot to return home with and unpack in future conversation. Advisory: Intermittent profanity and violence. This show is recommended for audiences 16 and over. “This Is All Just Temporary” plays until February 10, 2018, at Convergence Theatre in Washington, DC. For more information or to purchase tickets, call the theatre at (202) 631-6291 or click here. Katie Gaab is an avid concert and theatregoer, bouncing between DC and Baltimore to appreciate the arts. Outside of MD Theatre Guide, she spends her time studying dance, learning foreign languages and checking out way too many books from the public library.